I recently ran across this BBQ edition of Popular Plates and I'll cut to the chase and say that I recommend it highly. 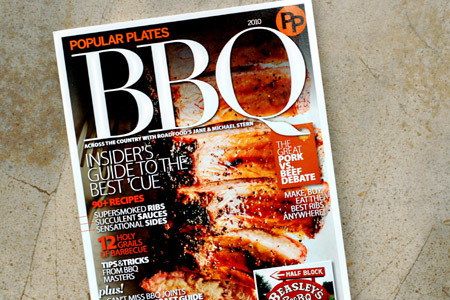 The barbecue community has often clamored for a glossy magazine and, although it's apparently a single feature edition, this is a great read and resource. 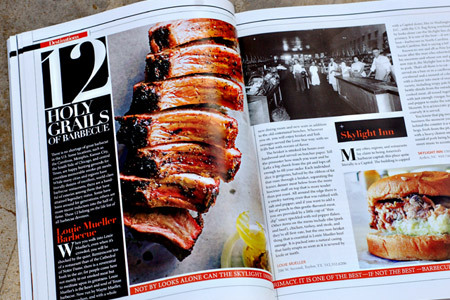 This magazine covers all of the BBQ hot spots. It's packed with a 5-region canvas of the best barbecue joints in the country. It also features great biographical articles, recipes, and some very nice photography. I've taken a couple of shots to give you a little bit of a feel for the magazine, but you can see a lot more at the Popular Plates web site. This edition is all that a barbecue magazine should be. Again, I highly recommend it. I bought the Pizza book and really enjoy that so I am sure the BBQ one must be just as good. I have to see if I can get a copy. I also have the pizza book. This is a series of one-off mags by the great Jane & Michael Stern of Roadfood.com and NPR. Good stuff! I don't know. Google is your friend. Failing that, contact the publisher.